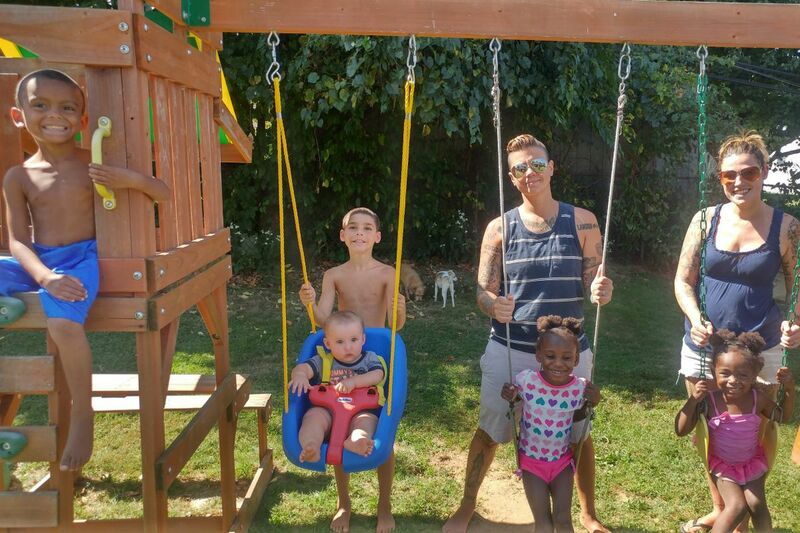 The Ponist clan, minus their current foster son (from left): Landon, DeAndre pushing Gavin in the baby swing, Alyx with Diane behind her, Kairah with Kristin behind her. WHY THEY ALL — INCLUDING DIANE — TOOK THE LAST NAME PONIST: Diane was raised by a single mother; Kristin's father became a role model for both of them. Diane's mother handed out custom-embroidered T-shirts that read, "And then there were five." Then she distributed spray cans of confetti to Diane and Kristin — who was two months pregnant — DeAndre and Landon, Kairah and Alyx. On cue, they pressed the plungers. Blue paper showered the front lawn. That's how they learned that the newest addition to their rapidly growing family was going to be a boy. Kristin had always yearned to have children. But when she met Diane, who'd moved in across the street from Kristin's parents, she was just 21. And though her father had always teased, "You should become a lesbian; it would double your wardrobe," Kristin considered herself bisexual at the time. Meeting Diane changed that. "As soon as I laid eyes on her, I knew I wanted to be with her," Kristin recalls. At first, the seven-year age gap felt chasm-wide; Diane owned her home and was raising two foster children; Kristin wanted to stay out late and live spontaneously. But while flirting with Diane, she fell in love with the kids — on zoo outings and bike rides and trips to the beach. And when the children left to live with a relative, Kristin saw the anguish of that loss. The children, ages 2 and 3 when they came to live with Diane, had been so deprived that they rooted in the garbage and ate crumbs off the counter; gradually, they learned to play on her backyard trampoline, to pump their legs on the swings, to smile. "After losing them, I went into a very big depression," Diane says. "I thought, 'I'll never do this again.' " She and Kristin put family-making on hold. In the meantime, they sealed their own relationship, becoming engaged in front of the Cinderella Castle at Disney World and marrying, in 2010, on the beach in Asbury Park, N.J. After that, they tried to conceive using donor sperm; when Kristin didn't become pregnant after several tries, they turned to the idea of adoption. They spotted 4-year-old DeAndre in an online digest of children legally available for adoption in Pennsylvania. Diane called Kristin at work to say, "He's the one." But when they met the boy, they felt temporarily daunted. DeAndre had autism; though he'd taught himself to read and was obsessed with electronics, he didn't speak. When he came to live with the two, after months of weekend visits, they plastered the house with flashcards — "Pretzels. Chips. Bananas." If DeAndre wanted something, they asked him to say it aloud. The couple adopted him in December 2012. "DeAndre became this amazing child," Diane recalls. "We decided maybe we could open our minds again to fostering." Kristin wasn't sure. But one night, at a Trenton Thunder baseball game, she watched a dynamic woman with her passel of seven children, the oldest of whom had autism. "She was a wonderful mother. I watched her for an hour and thought, 'We can do this.' "
Soon, there was another foster child, a vivacious girl whose verbal skills coaxed language from DeAndre, though her emotional needs — nightly screaming and sobbing sessions — were more than the women felt capable of handling. Landon came next, a 2-year-old who initially needed short-term respite care. When the two-week period ended, the agency called: "His foster family is not coming back. Would you like him as a permanent placement?" Their answer: Absolutely. They said yes to another foster child, a boy who ultimately was reunited with his birth mother. And then came the afternoon when Kristin called Diane to announce, "It's a girl!" "What?" her wife asked. The agency had called once again, this time about a fragile 9-month-old. "She melted into my arms, and the older kids doted on her," Kristin says. Two months later, another summons: Could they take Alyx, a toddler with serious health needs? She had a feeding tube and had undergone surgery for short-gut syndrome; caseworkers cautioned that she might not survive childhood. "The odds were pretty far against her," Diane recalls. "She would scream. She was terrified of the front door. She threw up in the car every time." But the pair persisted, taking Alyx to a series of gastrointestinal specialists, switching her formula, teaching her to chew. Kristin hadn't given up on her dream of pregnancy. "We had Alyx's health in complete order; everything was fantastic. I said [to Diane], 'Do you want to try?' I started calling to find the best fertility doctors." After the second intrauterine insemination, with anonymous donor sperm Diane chose to match her own mixed-European ethnicity, she wandered into the upstairs bathroom to see a drugstore test — Kristin had used it without telling her — that clearly read "pregnant." "Babe, we did it!" Diane exulted. The pregnancy was healthy but emotionally challenging in ways neither woman had anticipated; after raising children together, Diane feared this baby would be more bonded to Kristin. And then, one Friday last October, just after bath time, Kristin got a voicemail from the foster agency. She shouted the news to Diane: "One of our kids has a sibling who was just born!" "It gave me goosebumps," Diane recalls. "At first, we thought: No way can we do this. Kristin's six months pregnant. We're going to have five children." But Diane's mother, who lived with them, offered to retire so she could help full-time with the kids. "I felt like this was meant to be," Diane remembers. "We said, 'We want him. We'll take him.' "
Now there are six: one child by birth, four by adoption, one still waiting for a date in Family Court. When that happens, they will celebrate just as they have for each milestone — when DeAndre rode his bike without training wheels, when Alyx said, "I love you" for the first time. "All their adoptions are like a wedding day," Diane says. "You've lived with them, you love them, but now it's permanent. We're officially family now."